Deejai Backpackers is a lively guesthouse with a vibrant social scene located in a quiet part of Chiang Mai's old city, only 15 min walk from Thapae Gate and the main tourist bars. We have a new garden complex just 2 min walk from the hostel complete with a bar, restaurant, pool table and salt water pool. 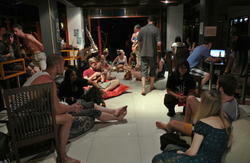 The garden is open to all backpackers in Chiang Mai with a reduced rate for Deejai guests for swimming pool. Our dorm rooms are 3 - 4 bed (please read full room details) with ensuite, we also have a range of private rooms to suite to needs of most travevers. In our newly renovated canteen we serve fresh coffee and cakes, Thai and western food (including the best available pure beef burgers in town). Our fridge is stocked with the usual local beers along with a couple of foreign lagers. wine coolers and Smirnoff / Bacardi mixers. For your safety, we have CCTV that covers all areas, as well as safety deposit lockers..